Investors in Mason Graphite (CVE:LLG) (OTCQX: MGPHF) enjoyed another up day on Tuesday, bringing gains for the Toronto-based company for the week to 25%. Shortly after the open the explorer was changing hands for $0.42 up more than 7%, but gave up some of those gains by early afternoon with more than 750,000 shares traded, double the average over the last three months. Tuesday's trade in Mason Graphite was tame compared to yesterday when the $26 million company was the second most traded stock on the Toronto venture exchange with more than 5 million shares finding new owners. Last week the company's shares began trading on the OTCQX marketplace in the US and company insiders have been picking up shares, but there was no fresh news out on Tuesday driving Mason Graphite higher. The company recently garnered the attention of none other than ex-CNN host Larry King and respected investor Jim Rogers. Mason Graphite's 100%-owned Lac Guéret graphite property in northeastern Québec, currently hosts a NI 43-101 compliant measured and indicated mineral resource of 7.6 million tonnes grading 20.4% Cg (carbon as graphite). According to an evaluation employed by TD Securities, 20.4% Cgr is the equivalent to about 9.1 g/t gold assuming graphite price of $1,750 and gold price of $1,250. 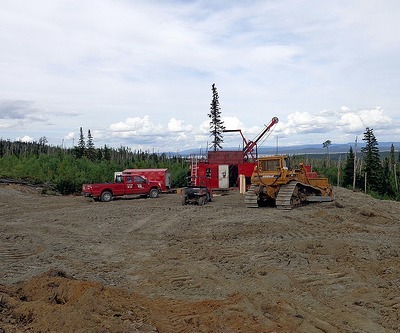 Mason Graphite which hopes to begin production by end-2015 claims great exploration potential exists on the property with the current mineral resource based on exploration of only 17% of one well defined zone. According to a September press release, Mason achieved purities of 99.9% graphitic carbon from preliminary tests using a conventional hydro-metallurgical process, improving on results seen in the preliminary economic assessment study. Mason Graphite is led by Benoit Gascon, who has held 20 years of executive positions at Timcal, including over 6 years as CEO. Timcal, now owned by Imerys, is the largest graphite producer in the world.